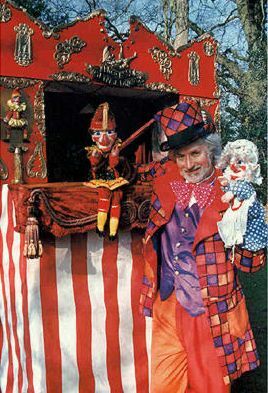 I describe myself as a Punch and Judy activist with a keen interest in promoting Mr. Punch and his tradition. For many years I wrote the Punchlines column in Animations (the UK puppetry magazine) before becoming editor of the magazine itself. Im a founder member of the two UK Punch bodies (The Punch and Judy Fellowship and The Punch and Judy College of Professors) and I originated The Worldwide Friends of Punch and Judy in order that Punch enthusiasts from around the globe could have a networking organisation. It now has its own newsletter, Around The World with Mr. Punch , purely devoted to Punch and his puppet cousins. I also teach the skills and traditions of the Punch and Judy Show and am currently writing the book of the course. Ive been a Punch Prof. for nearly 40 years and have performed at most kinds of venue from seaside beaches and village greens to Arts Festivals in the UK and mainland Europe. Unusual venues have included the British Embassy in Moscow, the Victoria and Albert Museum, and a very deprived inner city school in Naples. My wife Mary is a puppeteer and puppet maker and we work together as entertainers in Shopping Centres, Town Centres, Heritage and Tourism sites and at Festivals, carnivals and celebrations. We are based in Worcestershire, UK, and travel to wherever Mr. Punch wants to go. I have organised several Punch and Judy Festivals since being bitten by the bug when attending my first one in 1962 when the plaque commemorating Mr. Punchs 300th birthday was unveiled in Covent Garden. The 325 Celebrations of 1987 that I mounted to mark the next quarter century became a picture feature in the 1990 Guinness Book of Records celebrating the largest ever number of Profs assembled in one place. 150 in all. Promoting and writing about Punch is fun but it doesnt beat performing the show and putting Punch and the cast through their paces in front of a lively audience of children on the UK streets where he is still a star attraction. If youre a Punch enthusiast too, Ill be pleased to hear from you.